Providing the opportunity for our clients to give feedback and testimonials is an important part of the CPS marketing strategy as we want to ensure that we have performed to the best of our ability. We also use this information to help us improve our products and services as we have an ongoing commitment to increase the level of customer satisfaction in everything that we do. In a business to business environment which CPS operates within, the well-known saying of ‘people buy from people’ still carries a lot of weight. People have to believe in a particular product or service and trust the company offering it before they can truly consider making a purchase. Buyers now have an extensive source of information readily available at their fingertips to help them shop around for a particular product or service for their organisation. These buyers use this information to conduct research into a particular product or service before contacting the company for a quote or further information. 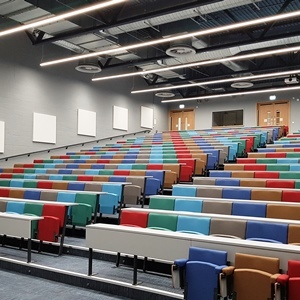 As a leading manufacturer of auditorium and lecture theatre seating solutions since 1966, we have received many positive testimonials along the way. We take tremendous pleasure from these in the knowledge that we have provided an excellent service and the customer is happy with our work. Jason Hughes, managing director of CPS, said: "Customer referrals and testimonials form a big part of our everyday enquiries so it’s vitally important that we continue to improve the products we manufacture and maintain a very high level of customer service. "We have developed a superb reputation over the last 52 years thanks to the quality of our products and services and we’re very grateful for every piece of feedback we receive and the referrals we gain from our clients. "It was great to receive the below feedback from a recently completed contract. Thank-you Overbury, we look forward to working with you again soon." The following comments were also noted: would recommend, developed the design with us, worked directly with the architect and were brilliant on site. A selection of our testimonials can be viewed here which provides further evidence why you should consider CPS. For all things seating, please contact Julian Ashmore on 01302 741888 for an informal discussion of your requirements or drop us an email.